Smooth-lined then painted recess (as outlined in this section). 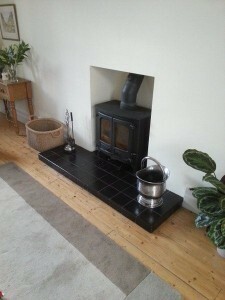 Note the offset flue to give clearance at the rear of the stove. Click for larger image. 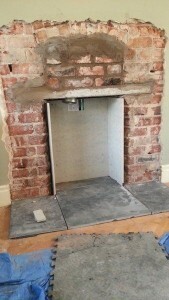 If you are going to line the inside of a fireplace (rather than render or just paint) then you’ll be using some kind of fireproof lining board. UPDATE TO THIS ARTICLE: ALTHOUGH I HAVE SUGGESTED DRI-WALL ADHESIVE TO STICK HARDIEBACKER TO WALLS (AS I HAVE OFTEN DONE) THE MANUFACTURERS RECOMMEND A CONCRETE-BASED TILE ADHESIVE. 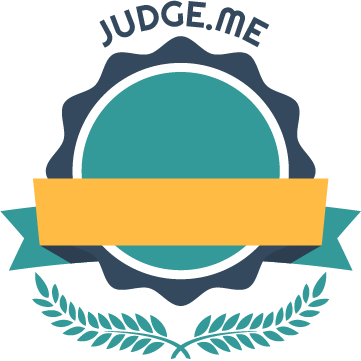 SEE LINK BELOW. 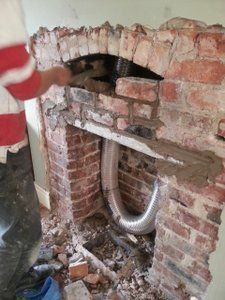 Before we get stuck in, there are various ways of making the inside of your builder’s opening look like something other than a dark, soot-stained hole in the wall. You can tart up what you have (e.g. 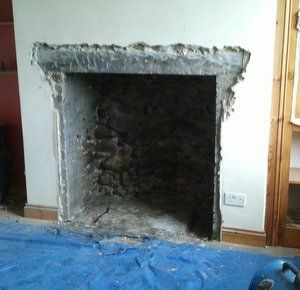 keep the stone or brickwork) filling any deep holes with mortar and adding a lick of paint. You might choose to render with concrete or go the whole hog (where did that phrase come from must check…) and make smooth with board. It might be worth you reading all of these sections before deciding. Whilst installing for a living the smooth-lining was my favoured method (over rendering) and approx. 90% of all my in-recess installs followed this method: the end result is very tidy. It is a method worked out and improved over the years. It is “suburban” smooth. It takes a little more effort but provides a professional finish for the more discerning client ;-). I say “was” my favoured method because now I no longer install and thinking about all that effort makes me break out in a sweat. I now like the “lazy” method below but this may be too basic for some. The following pics show the lazy bod method. It looks surprisingly effective and fits the architectural “honesty’ box. This is actually in my house (left pic in “the snug” and right pic in the lounge). The inside of the recesses I sprayed in black stove paint and by the time the stove was in, the recess cannot even be seen due it being dark. Essentially one just plasterboards the front of the chimney breast and adds a little return into the recess (using 12mm Hardiebacker for just the return as this is where the real heat is). I actually recommend NOT plastering the return as plaster can crack under high heat (I forgot to tell the plasterer so we’ll see if it cracks in my house!). Paint directly onto the unplastered Hardiebacker-returns same as the rest of the chimney breast. HardieBacker® 12mm cement backerboard (previously named HardieBacker®500) has been evaluated in accordance with the protocols and acceptance criteria of EN 12467 and was found to be compliant. 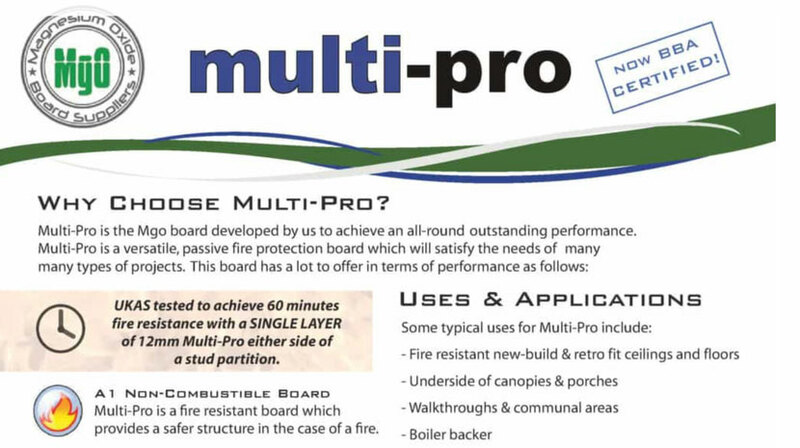 HardieBacker® 12mm cement backerboard is fire rated class A1, meaning the product is non-combustible. HardieBacker® 12mm cement backerboard is CE approved and BBA certified since May 2004. Hardiebacker say it is fine for up to 100 degrees centigrade (it will not set on fire but can crack). Note that you can get spider cracks in Hardiebacker (especially if if your stove is closer than 6″). This is more likely on the rear wall (where stoves are often 3″ or 4″ away from the wall). Cracks will usually be minor and can be repaired with Decorator’s Caulking. I have heard that compressed Vermiculite board (about an inch thick) is far better but it is very expensive and thick (reduces width of recess maybe too much). If you are after perfection then you might wish to add a layer of thin steel (1-2mm) to the Hardiebacker as a final and paintable surface. 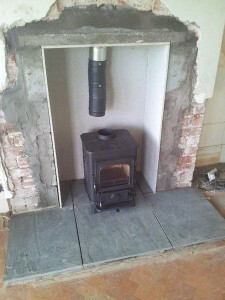 I have done this on back walls a few times when the fire has been close..
Another product is Thermalux (http://www.stovesonline.co.uk/stove-chimney-documentation/Thermalux-Heatproof-Stove-Installation-Sheets-72.pdf). I have not used it but a stovefitter I know uses it all the time to line recesses. Other lining products include Supalux, Skamolex, or Glasroc FireCase. Your “closure” plate, that seals off your chimney if you have a chimney liner, can also be made of one of these makes of board (not to be confused with a “register plate” used when there is no liner and then must be metal). 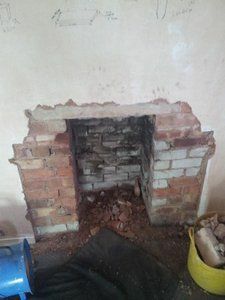 Okay, you have completed your breakout to your builder’s opening, ensured a lintel or arch is in place, and maybe fitted your hearth (you can do the hearth before or after the lining of the recess). Cutting Hardiebacker board (courtesy of “Kenny”)? I use these in a £20 Erbauer jigsaw from Screwfix and they make mincemeat out of 12mm hardibacker. I’m still on my first blade and I’ve made dozens (possibly hundreds) of cuts. Being able to cut hardi with a jigsaw gives you loads of control and I can also cut out neat circles for my vit pipe to go through. You can even scribe your hardi into an uneven surface (i.e. stone) and follow the line accurately with the jigsaw for a very neat fit. Dust is about 10% or less than that created by a diamond blade. These blades are probably my second favourite tool after my Bosch PCL 20 laser, which makes getting everything lined up, straight, and centred a total breeze. I hope my little tip is of some use to you. 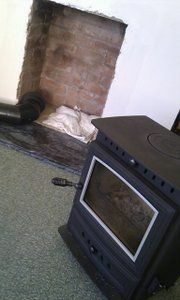 Happy stove fitting. This picture is worth ten thousand words! You can see the smooth walls of the builder’s opening. Plaster is off to see what is happening. You can see a new lintel being fitted below the discovered arch. You can see the bricking up between the lintel and the arch. You can see the liner ready to go. Same fireplace as the one above. Hearth down first. And now you can see the first three 12mm cement boards. I put the rear one in first (cut to size with angle grinder although I am told that a circular saw or jigsaw with a concrete cutting blade will do). The two sides go in next. 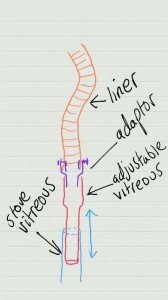 Attach adaptor to bottom of liner (couple of small self tappers to stop it falling off unless it has captive bolts) and attach black vitreous flue pipe to the adaptor using self tappers (fill any air gaps at both ends of the adaptor with fire cement and if the adaptor snout is a bit loose use fireproof rope or webbing if you wish). Go back up to top of chimney and pull liner up until vitreous is “up the chimney a bit out the way”. Finish the whole job: line fireplace, slide closure plate in, hearth down, stove in place, cup of tea etc..
Reach up the through the hole (you did make a hole I hope) in your closure plate and grab the vitreous pipe and pull it through the hole and down to and onto the stove (do not forget to fit your 9″ sealing plate around the pipe when you do this – in readiness for screwing it to your closure plate). Back to the chimney stack. 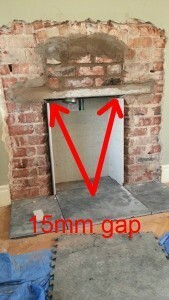 Use a marker pen to mark the liner about 1″ above the chimney pot. Pull the liner up 6″. Cut the liner at the marker pen mark. Fit the cowl to the liner. Drop the liner back down, vitreous pipe into stove, secure cowl to pot. Back down and screw sealing plate to closure plate. Bob should now be your uncle. But it is not always easy or possible to move the liner up and out the way – e.g. if the liner is a tight fit or you fitted the liner/cowl the week before and it is now fixed in place and the scaffolding is on somebody else’s house. In this case you cannot “slide your closure plate like a shelf” ‘cos the liner is in the way. In this case you fit the closure plate PRIOR to the sides by raising it within the recess, allowing a tapered adjustable section to drop through the hole in readiness for the bottom section of vitreous pipe later on. Adjustable vitreous (in red) will hang through the closure plate at least 4″ allowing you to easily slide your vitreous over it. When it comes to fitting your stove this can make life a lot easier (stove fit can be problematic if liner has no movement because flue needs to lift “up and over” a 2″ to 4″ stove collar). I will let you make your own mind up. Continue to read this section but also read “THE STOVE FIT>free standing in builder’s opening“. Then make your mind up. This article continues as if the closure plate is going in last of the boards but bear in mind what said when thinking about your install. Of the three vertical boards the rear cement board is the one to do first. Hardiebacker cement board is 1.2m x 0.8m so bear this in mind: ideally you want one piece at the back, rather than two, but this is not always possible. If you have to have a join have it down the middle maybe? Measuring for width is easy – just measure the width at the top and bottom of the recess (in case of slight tapering if the builder created the recess on a Friday) and cut your board accordingly. The gap allows another sheet of cement board to be slid in as a “roof”: the closure plate. The height of the rear board is more critical: you want the top of the rear board to be completely horizontal and 15mm below the height of the lintel. This is because the top edges of these first three boards will provide a shelf, a flange, on which your closure plate will sit (your closure plate will be made of the same board and will slide in to sit on the first three boards). Whilst looking ahead to this “sliding in” ensure that there is a gap all the way to the back wall – no low hanging bits of mortar or brick etc. to stop the closure plate being slid in. Why 15mm? Because the Hardiebacker closure plate is 12mm thick and we want as little gap as possible between the top of the board and the bottom of the lintel (we’ll be screwing the board up to the lintel shortly). The two side boards will be exactly the same height as your rear board and also need to be completely spirit-level horizontal along the top edge. These side boards will also need to project forward of the brickwork or stone or block a small amount (small amount = the thickness of any plaster surface less 3-5mm). The reason for this is that you will be attaching “skim bead” to the front edge of the left and right boards and this will stick out 3-5mm. Skim bead is a hard strip that you will plaster to. These front edges may or may not be vertical – they will be the same as the walls! The above is a little hard to explain so I have another scribble. 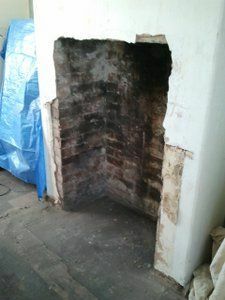 The scribble is a top down view of the left hand side edge of a chimney breast where some of the plaster has been removed from around the recess. 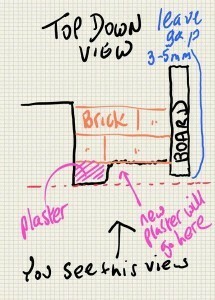 Where it says “new plaster will go here” – this might be bonding/plaster or it might be plasterboard with a skim on top. Things should become easier to understand as we progress and see a few more pictures. How do we attach the cement board to the inside walls of the recess? Quite simply we use dri-wall adhesive (available from all good merchants). 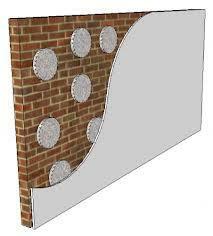 This is exactly the same process as is used to attach plasterboard to a brick/block/stone wall. Note that you can use Thunderbolts instead of adhesive and we often do if the walls are flat and true. Before you start you will want to paint the surface of the inside walls of the recess and one side of the cement board with a PVA mix (3 water to 1 PVA). This is very important as without this stage the bond between wall and board may not be good. Mix dri-wall adhesive with water so you get a thick consistency (wetter rather than drier is better). Coat the board and the wall with copious amounts of the dri-wall. You do not need to let the PVA dry and if it does dry add another wetting. NOTE: Feedback suggests that it is better to “smear” the dri-wall rather than have large independent islands of the stuff – thick scattered blobs can cause shrinkage in the dri-wall with this warping the boards. 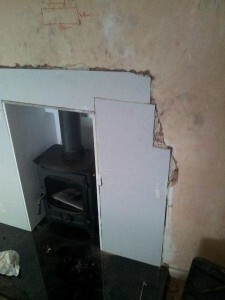 The less air between the board and the wall the better (a fellow stove fitter reckons air pockets is what causes minor cracking of Hardiebacker under extreme heat due to the trapped air expanding). Leave 12 hours to go off. You will use a spirit level to check the sheets are vertical and the top edges horizontal. You can use wedges along the bottom if required. Tip: You will find it easier to attach the rear board first, before measuring and cutting the side boards (otherwise you will be guessing the thickness of your back wall which is not possible to do accurately. Before we proceed to our “closure plate” (the plate that seals off the chimney) I want to proceed with a “here’s one I made earlier”. In other words I am going to move forward in time to a point where our closure plate is already fitted. We’ll come back to the creating and fitting of the closure plate shortly so forget it for the moment. This is the picture we are aiming for eventually: the rear and side boards are in as is our closure plate (with our flue hanging down ready in this case to be pulled down with somebody on top of the stack pushing down). 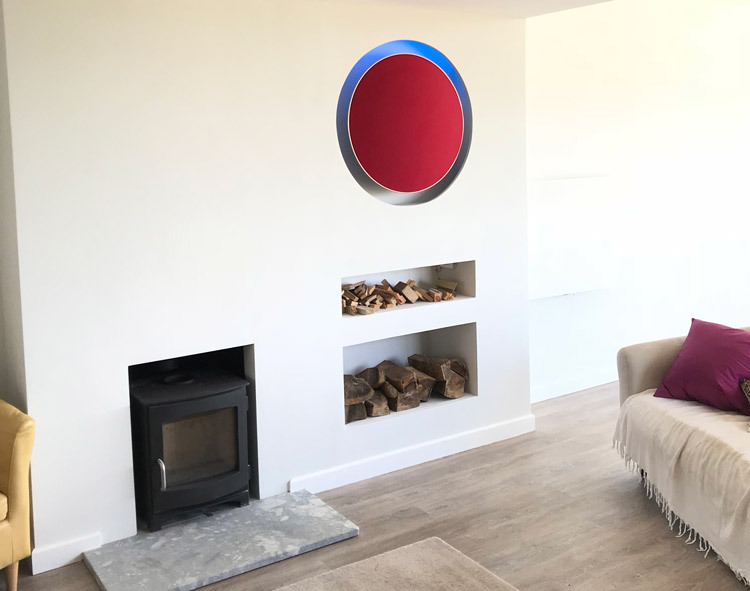 You will note that we have filled in any gaps around the edges of our boards – using any spare dri-wall adhesive (dot and dab gunk) or bonding (plasterer’s use it). Always PVA all surfaces, to ensure good bond. The closure plate is actually screwed up to the lintel (more in the closure plate section shortly). 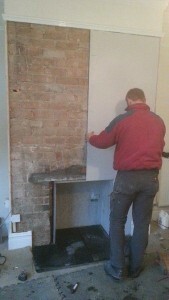 My colleague is seen here cutting plasterboard to fit the chimney breast in readiness for dot and dab. Often it is easier to remove all the plaster from a breast (especially if it is old and not well attached). Plastering a whole area can also be easier than trying to blend a small “repair area” into the rest of the plaster. 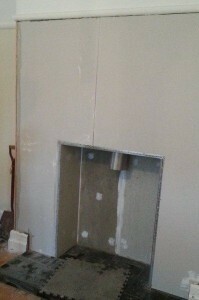 And here is the chimney breast ready to plaster. The skim bead is in place (close ups on the way). Note the centre join in the cement board: the white stuff is Decorator’s Caulking applied with an old credit card which can be painted (do not use silicon). No need to prepare surface for the caulking. Another example. Note that you do not have to use plasterboard – you can fill with bonding and then plaster. This all down to preference. You need to buy “skim stop bead”. NOT the right-angled stuff. Attach it using short clout nails. It provides an edge to plaster to and gives strength to corners. 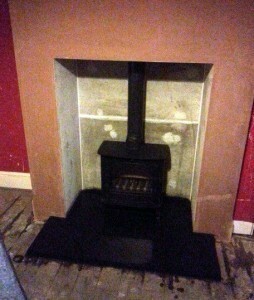 Finished plastering. Ready to paint when the plaster has dried. 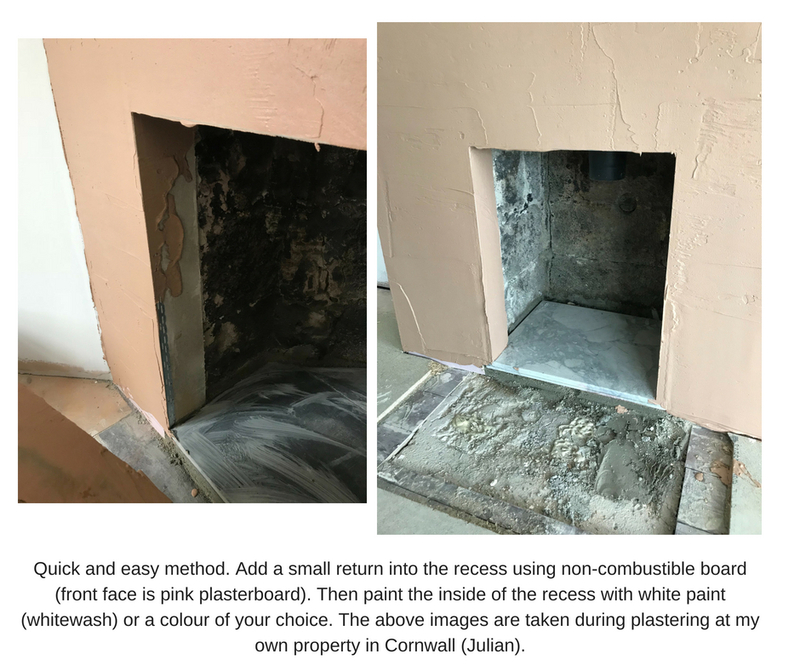 Inside of recess can be painted but should never be plaster-skimmed as the heat will crack the plaster. Note this job was a large opening so the rear wall used two sheets of cement board. 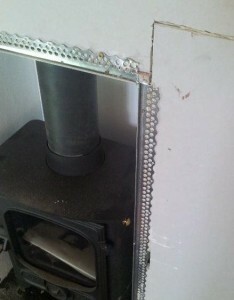 I am not going to deal with the closure plate here but will deal with it as part of the stove fit itself. The continuation of this article is found within the “Stove fit to flexible liner” section of this manual.